Firm and sound working conditions are inevitable during the construction of buildings, powerhouse, dams, and other structures. These structures not only require a dry base for their foundations but also a good water-table-stability. Dewatering during excavations is required at construction sites generally for foundation works. Dewatering of any excavated area is done in order to keep the excavation bottom dry so that excess water does not weaken the concrete or wash away cement. The excavation or laying foundation in the waterlogged ground is a very tough activity. The presence of continuous water or flooding during work may result in the poor quality of the construction work. Sometimes, it becomes a very challenging job for the experts. Where to Rest Foundation or What should be the Minimum Depth of Foundation for a New House? How to Do Foundation in Water? What Causes Waterlogging on Site? In the rainy season, the surface water may get accumulated on site due to the difference of elevation of the ground. Waterlogging may also be found at the depth of foundation due to the higher level of water table or collection of rain-water in an excavated pit. Generally, water is found at the depth of foundation due to the high water table. A water table is a zone of saturation in ground and it is found in soil-strata at a particular level due to percolating rainwater or water flowing from groundwater. Due to the high water table, water continuously flows up with pressure in the foundation pit which creates problems when you excavate pit for foundation or pour concrete. The water on ground surface can be easily diverted to another place by providing necessary slope to the ground or by directing the water through the man-made channel. The rainwater collected in excavated pit can be easily pumped out with help of mud pump (anti-coagulant pump). It is possible only in case of waterlogging which is not caused due to the water table. But if high water table caused waterlogging, then removing water or sludge from bottom of the foundation becomes the most difficult activity. Remember now it is not only removing water, but the challenge is removing mud or mud slurry. Further, the moist soil may invite further collapse of sides of pit, creating more mud and more problems and challenges. 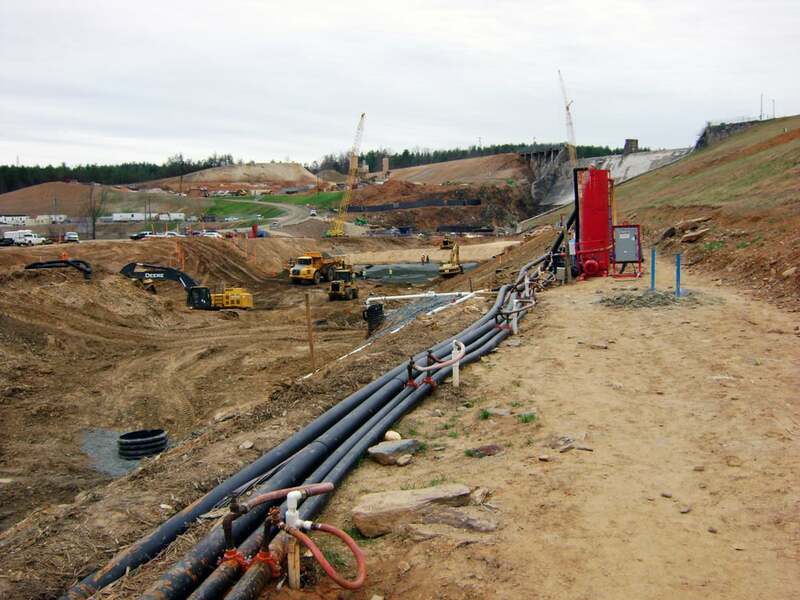 Different types of dewatering methods or techniques are available for dewatering of excavation. The different methods available for dewatering of excavations at constructions sites are executed uniquely as each one has a narrow range of applications. Thus adopting the right method of dewatering for a particular ground condition is always an important and a difficult decision to make. Here we have given brief information on dewatering methods commonly used for dewatering excavations on a construction site which a site engineer must know. Also Read: 10 Important Criteria to Choose the Right Foundation for House! There are various dewatering methods to deal with the situation which depend upon the depth of excavation, depth of water table, types of soil, surroundings, seasons and many other factors. 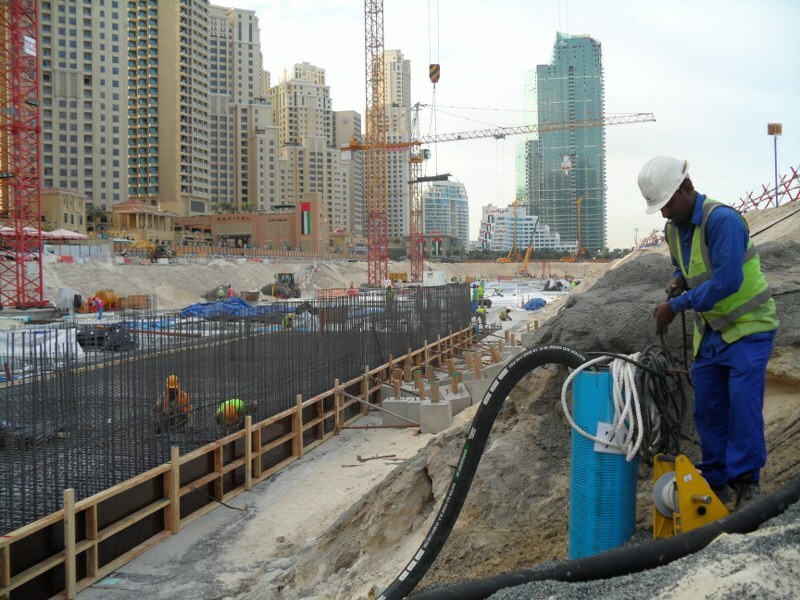 Following are the dewatering systems which are used to remove the water from the excavation pit. In most of the regions, the shallow foundations are used to build a house. This method is more suitable for dewatering the pit of a foundation. In this method, drains and sump of suitable size are constructed by the sides or in one corner of the foundation pit. The drains collect subsoil water from the sides and the enclosed area of foundation pit and convey it into a sump. From the sump, the water is continuously evacuated manually or mechanically. This is the cheapest method of dewatering. It can be easily carried out by deploying unskilled labour and by using a pump. This method helps to remove rainwater or groundwater from the excavated pit of a foundation by gravity force. This method is also known as an open sump pumping method. If the excavation area is large, several sumps may be placed along the longer side or simply use a long narrow sump which is called a ditch. This method is generally used where a large quantity of groundwater is required to be bailed out. Deep well dewatering system can drain out water up to 24m depth. In deep well system, 30 to 60 cm (1 to 2 feet) diameter wells are constructed at 6 to 15m centre to centre around the periphery of site. once water is collected at the lower end of wells, it is pumped out away from the site. The number, depth, and spacing of deep wells along with the capacity of pumps can be adjusted to meet site conditions. Deep well a system is not used to dewater the foundation pit of a small house as it is very costly. In this method, the water-logged soil which is soft or like mud is converted into a semisolid mass by chemical reaction. The silicates of soda and calcium chloride are applied or mixed into the soil which is generally found in cement, fly ash, lime, or a combination of these. Cement, fly ash, lime, or a combination of these chemicals are also added to soil to change its properties and consolidate it. This method of dewatering can be used for a small works. This is a method of keeping an excavated area dry by intercepting the flow of groundwater with pipe wells driven deep into the ground. The wellpoint consists of a perforated pipe which has a ball valve to regulate the flow of water. It also prevents the mud from entering into the pipe. The well point is connected to riser pipe and is sunk into the ground by jetting of water. This method can be successfully adopted for the depth of excavation up to 18m. To know more about wellpoint system, refer Dewatering Method – Wellpoint system for waterlogged sites. The method is very similar to the WellPoint method of dewatering; the only difference lies in the usage of high-pressure water in the riser units instead of vacuum to draw out water from the well points. The method uses the venturi principle which is the reduction in fluid pressure that results when a high-pressure fluid flows through a constricted section of a pipe. A high-pressure supply main feeds water through a venturi-tube just above the well-screen, creating a reduction in pressure which draws water through the riser pipe. The high pressure main feeds of the return water. The advantage of using the educator dewatering method is, the water table can be lowered from depths of 10-45 m if multiple pumps are operated from a single pump station. This method, therefore, becomes economical with the soils of low permeability. This method is generally used in highway or airport construction. Sand drains prove very effective in marshy soils. Soil becomes marshy when the thick layers of clay and the silts are deposited with the organic matter for the long interval of time. Marshy soil is subjected to capillarity, and it has a high pore water pressure. When wet marshy soil is subjected to load, water is gradually pushed out on either side which results in the sinking of an area of land. Sand drains are made to avoid this action in the ground. The diameter of the sand drains usually varies between 300 mm to 450 mm. They are placed at 3 to 6 m centre to centre spacing. The hole for construction of sand drain can be made by driving steel pipe casting into the ground. The drain holes are driven deeper up to an underlying rock or firm base. The soil in the pipes is removed by means of water jets. The specific type of sand is then filled into the pipes and the pipes are withdrawn leaving vertical sand piles in the ground. A thick layer of sand is spread over the entire area to be consolidated. When the sand layer is subjected to load, the water from the marshy soil gets squeezed into the vertical sand drains. By capillary action, the water rises up from the sand drains and is spread out into the sand blanket made at the top of the ground. From where it can be collected and drained out. Freezing process is most suitable for excavation in waterlogged soils like sand, gravel and silt. It is favourably used for deep excavation such as the foundation for bridges etc. especially when excavation is to be made near the existing structure or near some waterways. In freezing process, the cofferdam is created by freezing the soil around the area to be excavated. Pipes of smaller diameter are to be sunk about one-metre centre to centre along the periphery of the excavated area. The layout of the pipes should be such that the area enclosed is circular in plan. A freezing liquid is then supplied to the pipes by a refrigeration plant. This makes the ground around the pipes for to be excavated cold. This process can be used up to 30 m depth of excavation. Freezing process is not used to dewater the foundation pit of house as it is very costly and not feasible for a common man. This process requires very expensive equipment and hence it is rarely used. Wellpoint system is ineffective in very fine sands, silts or clay because such soil has a tendency to hold the water by capillary action and offer excessive resistance to percolation. It has been known that if a direct current is passed through the soil of low permeability, its rate of drainage is greatly improved. In the process of electro-osmosis, steel rods forming the positive electrodes are driven into the soil midway between the well points, which are made to act as negative electrodes. When an electric current is passed, the groundwater flows in the direction of the negative electrode where it is collected and pumped out. Thus, when you face a problem of water in a foundation pit, water can be drained off from a shallow or deep foundation with aforementioned types of dewatering methods. Depending upon the condition of the site, use aforementioned types of dewatering methods to dewater the excavated pit of a foundation. Previous PostPrevious What is the Size and Cost of Plywood? Next PostNext Which is Best Load Bearing Structure or Frame Structure?